"Building a Bigger & Better PLN"
Educators, and professionals in any field for that matter, will find it increasingly difficult to keep current and informed without a well-established, organized personal learning network. 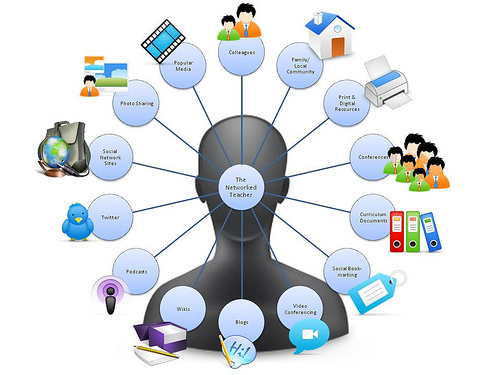 A personal learning network is a primarily web-based collection of personal connections and learning resources. PLNs provide 24/7/365 global opportunities to gather, review, and share information. "Personalized" learning, coupled with anytime collaboration, make PLNs centerpieces for professional development. This well-crafted video explains the process, and benefits, of building a supportive PLN. Who else is learning this? How can I connect with like-minded people? How can I share my knowledge? While there are hundreds, if not thousands, of web resources to help you build your PLN, my personal favorite choices are Twitter and Google+. I use Twitter for breadth in my up-to-the-minute fact finding and sharing. Google+ allows me to obtain more depth, along with, more sharing options with like-minded, or interest-based "circles". I also use a classroom LMS, Schoology, to provide a combination of local connections with students, teachers, and parents, while also providing global connections with other educators. Learning occurs daily from my PLN. My PLN experiences are personalized based upon my interests, my existing knowledge, and my professional involvement. I have been able to gain insight and information from giants in the educational field. Finally, I would find it nearly impossible to keep current with the constant changes that define educational technologies without the help of my PLN.